Also known as Kataki and Maniabandhi, Khandua sarees and fabric are domestic to the state of Orissa. These sarees are characterized by the vibrant hues that give them an almost rainbow-like appearance. Khandua sarees use the Ikat method for the dyeing process. The origin of the Khandua fabric can be traced back to over 800 years. The poet Jayadev decided to write the entire Gitagovind on a piece of silk to drape around the idols in Jagannath Puri. Thereafter, administrators of the Jagannath Puri temple asked weavers to specially weave fabric for the idols of Jagannath, Subhadra, and Balabhadra during special occasions. This tradition continues to exist till date except that now, this fabric has also found its use in daily wear sarees, decorative items, etc. During the Rath Yatra, the holy idols usually are draped with Khandua fabric. It is located in Nuapatna and consists of over 10000 weavers with approximately 6000 looms. There is a high degree of craftsmanship in this cluster and they weave using the Ikat technique. The natural curve motifs are preferred over the geometrical ones. A variety of products ranging from dupattas, stoles, sarees, cushion covers to curtains. The price of these products lies between Rs400 and Rs2500. 1.Motifs include fish,swans,peacock,deer,dance of the devadasis,etc. 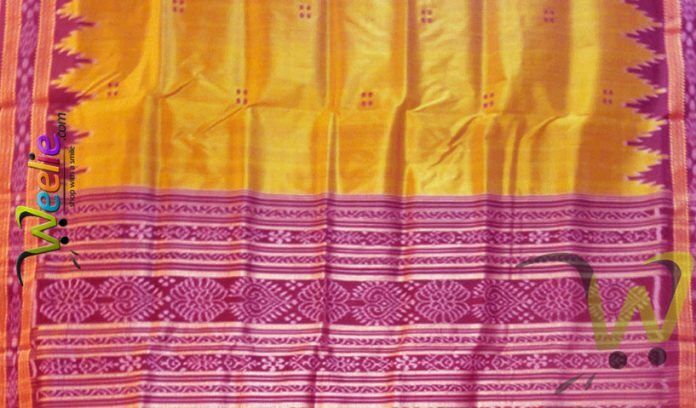 In some sarees, the entire Gitagovind is also block printed onto the saree. 3.2 and 4 ply silk is used in the fabric, not twisted silk. 5.Prominent colours used for dying are red, maroon, black and white. 6.Dying is carried out in a clay pot. Khandua sarees are a representation of our rich culture and excellent craftsmanship. Unfortunately, due to various emerging trends and some environmental laws, this fabric is becoming less popular thus, putting the employment of the Nuapatna weavers at stake. However, you could do your part in helping out these weavers by buying beautiful Khandua fabric pieces the next time you visit Orissa.